The innate immune system is central in maintaining the integrity of an organism constantly challenged by pathogens. Among innate immune cells, splenic marginal zone B (MZB)3 lymphocytes are strategically located to respond to blood-borne microorganisms and viruses and to play an important role in host defense (1, 2, 3). Upon Ag encounter via the BCR, MZB cells swiftly produce large quantities of IgM Abs that mediate protection at early stages of infection (1, 4). Along with their ability to produce Abs, MZB cells also affect the T cell response. For instance they can migrate into the splenic follicles to deliver immune complexes to follicular dendritic cells (DC), a mechanism that is crucial for the initiation of the adaptive immune response (5). In addition, and unlike follicular B cells, MZB cells have a unique capability to prime naive CD4+ T lymphocytes and drive their differentiation into effector cells. Indeed, upon in vivo Ag uptake via their BCR, MZB cells directly promote Ag-specific CD4+ T cell proliferation and cytokine production (6). Along with these studies, recent evidence suggests a role for innate sensors in MZB cell-mediated immune responses. MZB cells are indeed well equipped in TLRs and their stimulation leads to cell proliferation, maturation (i.e., cytokine production) and Ab production (7, 8, 9). However, the consequences of TLR triggering on the ability of MZB cells to activate and orientate conventional as well as innate-like T lymphocytes, including invariant NKT (iNKT), has not yet been examined. iNKT cells, the major subset of NKT cells, are defined by the canonical Vα14-Jα18 TCRα-chain in mice (Vα24-Jα18 in humans) and recognize exogenous and self (glyco)lipid Ags presented by the non-classical class I molecule CD1d expressed on APC (10, 11). Upon primary stimulation, in particular in response to the non-mammalian glycolipid α-galactosylceramide (α-GalCer), iNKT cells produce large amounts of immunoregulatory cytokines, including IFN-γ and IL-4, that lead to downstream activation of DC, NK cells, B cells, and conventional T cells (10, 12). During stress conditions (i.e., infection), iNKT cells have also been shown to release cytokines to shape immune responses, with beneficial or detrimental outcomes depending on the nature and site of stimulation (10, 11, 12). During infection, it is likely that TLR activation in sentinel cells, such as DC, plays a key role in the indirect activation of iNKT cells (13, 14, 15, 16). A recently described aspect of iNKT cell function is their ability to regulate humoral responses during infection and autoimmune diseases (17, 18, 19, 20, 21, 22, 23). Studies performed in the human and mouse systems reported that iNKT cells can help B cells to mature, proliferate, and produce Abs (both IgG and IgE) through a CD1d-dependent mechanism (24, 25, 26, 27, 28). It was also shown that co-administration of α-GalCer increased Ig responses to T-dependent or T-independent Ags, thus underlining the adjuvant properties of α-GalCer on Ab production (26, 28, 29, 30, 31). More recently, some reports demonstrated that α-GalCer targeting to the BCR leads to enhanced B cell responses in vivo (32, 33, 34). In this case, B lymphocytes efficiently present α-GalCer to iNKT cells promoting their activation, thereby enhancing Ab production. Interestingly, MZB cells have a pre-activated phenotype and highly express MHC class II and CD1d molecules as well as co-stimulatory molecules (2, 4, 35). In addition, Stetson et al. reported (36), in the mouse system, that iNKT cells localize in the splenic B cell area including the marginal zone. Thus, MZB cells may play a role in iNKT cell activation as recently suggested (32, 34). In these reports, the authors demonstrated that specific BCR uptake of α-GalCer in MZB cells leads to efficient iNKT cell activation, a finding also observed with total B cells (32, 33, 34). While this mode of BCR-mediated Ag internalization might be important in the case of particulate antigenic lipids in vivo, for instance to induce specific B cell proliferation and Ab production, the effect of free CD1d-restricted glycolipids (i.e., α-GalCer) on MZB cell/iNKT cell interactions is currently unknown. In the present report, after studying the response of murine MZB cells to a panel of TLR agonists as well as their ability to activate and polarize conventional T lymphocytes in vitro, we sought to address this question. Pam3CSK4 was purchased from EMC Microcollections and poly(I:C), ultrapure LPS (from Escherichia coli serotype 0111:B4), resiquimod (R848), and type B CpG ODN (ODN 1826) were obtained from Cayla. α-GalCer was purchased from Axxora Life Sciences. Allophycocyanin-conjugated mAbs against mouse CD5, CD19, PE-conjugated anti-NK1.1, -CD23, -MHC class II, FITC-conjugated anti-CD21, biotin-conjugated-CD1d, -CD40, -CD86, and PE-Cy7-conjugated streptavidin and isotype controls were purchased from BD Pharmingen. The neutralizing goat IgGs directed against IL-12 Ab was obtained from R&D Systems and the isotype control Ab was purchased from Sigma-Aldrich. Six- to 8-wk-old male wild-type (WT) C57BL/6 mice were purchased from Janvier. Eight-week-old male OT-II mice were purchased from Iffa Credo. The generation of Cd1d1−/− deficient C57BL/6 mice has been already described (37). Mice were bred in our own facility in pathogen-free conditions. Animals were handled and housed in accordance with the guidelines of the Pasteur institute Animal Care and Use Committee. Splenocytes were harvested and mechanically homogenized. After washes, RBC were removed with lysis buffer (155 mM NH4Cl (pH 7.4), 10 mM NaHCO3, 0.1 mM EDTA). For sorting of MZB cells, spleen mononuclear cells (MNC) from WT mice, which contain approximately 2–3% of CD19+CD21highCD23low cells, were labeled with allophycocyanin-conjugated anti-CD19, PE-conjugated anti-CD23 and FITC-conjugated CD21 mAbs. After cell surface labeling and washing, cells were electronically sorted using a FACSAria (BD Biosciences). Sorted CD19+CD21highCD23low cells were ∼99% pure (see Fig. 1⇓). TLR agonists activate MZB cells to proliferate and to produce cytokines. A, Flow cytometry-based sorting of MZB cells. 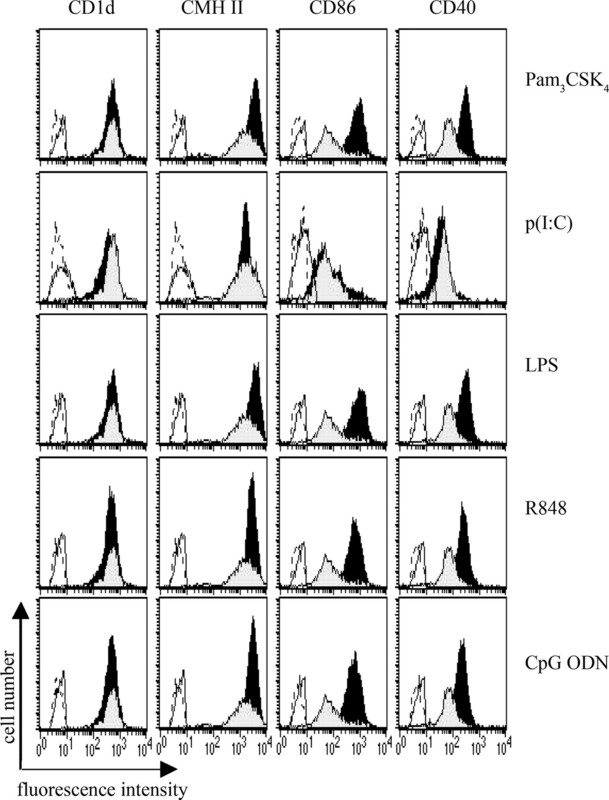 Dot plots represent the MZB cell population (CD21highCD23low) among gated CD19+ lymphocytes before and after cell sorting. B, Highly purified MZB cells were cultured in the presence of Pam3CSK4 (1 μg/ml), poly(I:C) (10 μg/ml), LPS (5 μg/ml), R848 (200 nM) and CpG ODN (5 μg/ml) for 18 h. Proliferation was assessed using Alamar blue and cytokine production was quantified by ELISA. Of note, although inactive on MZB cells, poly(I:C) induced DC maturation (Ref. 14 ; and data not shown). Shown is a representative experiment out of two (proliferation) or four (cytokine production). Data represented the mean ± SD of duplicates. DC were generated from the bone marrow of mice, as previously described (38). In brief, bone marrow-derived cells were cultured in RPMI 1640 medium supplemented with 10% FCS and 1% of supernatant from a GM-CSF-expressing cell line (J558-GM-CSF) (20–30 ng GM-CSF/ml). DC were used on day 14 of culture. To prepare liver MNC, perfused livers from naive WT mice were harvested and mechanically homogenized. After extensive washes, liver homogenates were resuspended in a 45% Percoll gradient and after centrifugation the cells in the pellet were recovered. RBC were removed with lysis buffer. For sorting of NKT cells, liver MNC (or spleen MNC) from WT mice were labeled with allophycocyanin-conjugated anti-CD5 and PE-conjugated anti-NK1.1 mAbs. Cells were then electronically sorted using a FACSAria (Becton Dickinson). Sorted CD5+ NK1.1+ populations were always at least 98% pure. The percentage of hepatic and splenic iNKT cells, as measured by CD1d/α-GalCer tetramer staining, was ∼90 and 50%, respectively. Purified MZB cells were cultured overnight at 2 × 105 cells/well in RPMI 1640/5% FCS in the presence of endotoxin-free TLR ligands. Proliferation was assessed using Alamar blue and cytokines present in MZB supernatants were quantified by ELISA using commercial kits distributed by R&D Systems and PBL Laboratories (IFN-β). Phenotypic analysis of purified MZB was performed with PE-conjugated anti-class II MHC or biotin-conjugated anti-CD1d, -CD40, or -CD86 Abs. In brief, 2 × 105 cells/well were plated in 96-well plates, resuspended in 20 μl of the appropriate primary Abs diluted in PBS supplemented with 5% FCS and 0.2% NaN3 and incubated on ice for 30 min. After washes, PE-Cy7-conjugated streptavidin were added when needed for another 20 min, followed by three washes. After the last wash, cells were fixed in 1% paraformaldehyde in PBS and were analyzed on a FACSCalibur flow cytometer. Data were analyzed using CellQuest software (BD Biosciences). MZB and DC were pulsed with OVA (50 μg/ml) or OVA peptide (1 μg/ml). After 18 h, MZB (2 × 105) and DC (5 × 104) were washed, mitomycin-C treated and cocultured in round-bottom 96-well plate with 1.5 × 105 CD4+ CD62Lhigh T lymphocytes purified from the spleen of OT-II mice. After 5 days cells were transferred to a flat-bottom 96-well plate previously coated with anti-CD3 mAb (5 μg/ml). After 2 days, IFN-γ and IL-4 production was measured in the culture supernatants by ELISA (R&D Systems). Sorted MZB cells (2 × 105 cells/well) or DC (5 × 104 to 105 cells/well) were stimulated with α-GalCer (100 ng/ml) for 3–4 h or CpG ODN for 18 h, extensively washed with PBS, and cultured for 48 h with sorted spleen or hepatic CD5+ NK1.1+ cells (5 × 104 NKT cells/well) or the iNKT cell hybridomas DN32.D3, 2C12, or 5KC (105 cells/well) in round-bottom 96-well plates in RPMI 1640 supplemented with 5% FCS. In some experiments, WT or CD1d−/− DC (104/well) or MZB cells (2 × 105 cells/well) (sensitized or not) were added to hepatic CD5+NK1.1+ cocultured with MZB cells or DC, respectively, preloaded with α-GalCer. Culture supernatants were collected and cytokine production was analyzed by ELISA (R&D Systems). Splenocytes were labeled with allophycocyanin-conjugated anti-CD19, PE-conjugated anti-CD23, and FITC-conjugated CD21 mAbs. After cell surface labeling and washing, MZB cells were electronically depleted using a FACSAria. Control spleen cells have also been labeled with Abs and passed through the FACSAria. Mice were injected i.v. with unsensitized or α-GalCer-sensitized MZB cells (106/mouse) in 200 μl of PBS. Spleen and saline-perfused livers were harvested 3 h later, and MNC suspensions were prepared as described above. Cell suspensions were incubated with appropriate dilution of APC- and PerCP-conjugated CD5 and NK1.1, respectively, for 30 min in PBS containing 2% FCS and 0.01% sodium azide. Cells were then fixed in PBS 1% paraformaldehyde for 10 min, resuspended in PBS plus 2% FCS and 0.1% saponin (permeabilization buffer) and incubated with PE-conjugated mAb against IFN-γ or IL-4 or control IgG mAb. Cells were then analyzed on a FACSCalibur flow cytometer using the CellQuest software (BD Biosciences). The statistical significance of differences between experimental groups was calculated by an ANOVA1 with a Bonferroni post test or an unpaired Student’s t test (GraphPad Prism 4 software). Results with a value of p < 0.05 were considered significant. During stress conditions (i.e., infection), activation of TLR in APC, including DC, is important to promote innate and acquired immune responses (39). The impact of TLR activation on MZB cells is however ill-defined. Using canonical agonists, we analyzed the response of MZB cells to diverse TLR agonists in terms of phenotypic maturation and cytokine production. For this, MZB cells were sorted on the basis of CD19, CD21, and CD23 staining (∼99% purity, Fig. 1⇑A) and exposed to optimal doses of TLR agonists known to induce DC maturation (14). Different activation parameters were analyzed following overnight stimulation. As depicted in Fig. 1⇑B, sorted MZB cells proliferate in response to all tested TLR agonists, except poly(I:C) (TLR3), thus confirming recent data (8). MZB cell expansion was accompanied by cytokine secretion. Indeed, all TLR agonists (except poly(I:C)) induced IL-6 and IL-10 production by MZB cells, R848 (TLR7/8) and CpG ODN (TLR9) being the most potent inducers. These results confirm and extend recent data reporting IL-6 and IL-10 secretion by MZB cells following TLR2, 4, (7/8, our study) and 9 stimulation (7). On the other hand, IL-12p40, TNF-α, IFN-γ, IL-4 and IFN-α were not detected whatever the agonist used (Fig. 1⇑B and not shown). Interestingly, MZB cells secrete IFN-β, but only in response to CpG ODN. We then investigated whether TLR agonists could lead to phenotypic maturation of MZB cells (Fig. 2⇓). Although unstimulated MZB cells express a relatively high basal level of Ag presenting (MHC class II, CD1d) and co-stimulatory (CD40, CD86) molecules, TLR stimulation (except TLR3) leads to an increased MHC class II, CD40 and CD86 expression, whereas CD1d expression is unmodified. In conclusion, our data show that, except for poly(I:C), MZB cells stimulated with TLR agonists display similar proliferation and phenotypic maturation but differentially secrete cytokines, according to the TLR agonist used. Since CpG ODN is the most effective agonist to promote cytokine production, including IFN-β secretion, we concentrated on CpG ODN for the rest of the study. TLR agonists enhance MHC class II, CD40, CD86 but not CD1d expression on MZB cells. FACS analysis was assessed on highly purified MZB cells, cultured without (gray histograms) or with (black histograms) TLR agonists for 18 h. Dotted and plain lines represent isotype controls on unstimulated and stimulated MZB cells, respectively. A representative experiment out of two is shown. We next evaluated the ability of unstimulated and CpG ODN-stimulated MZB cells to present Ag to CD4+ T lymphocytes. As professional APC, DC were used as a positive control. Unstimulated or CpG ODN-stimulated MZB cells or DC were sensitized with whole OVA protein or OVA peptide and, after extensive washing, were cocultured with purified OVA-specific naive CD4+ T cells. After 5 days, T cells were re-stimulated with anti-CD3 and cytokine production was measured 2 days later. In this setting, OVA and OVA peptide-sensitized DC induced IFN-γ production by CD4+ T lymphocytes whereas, in agreement with Constant et al. 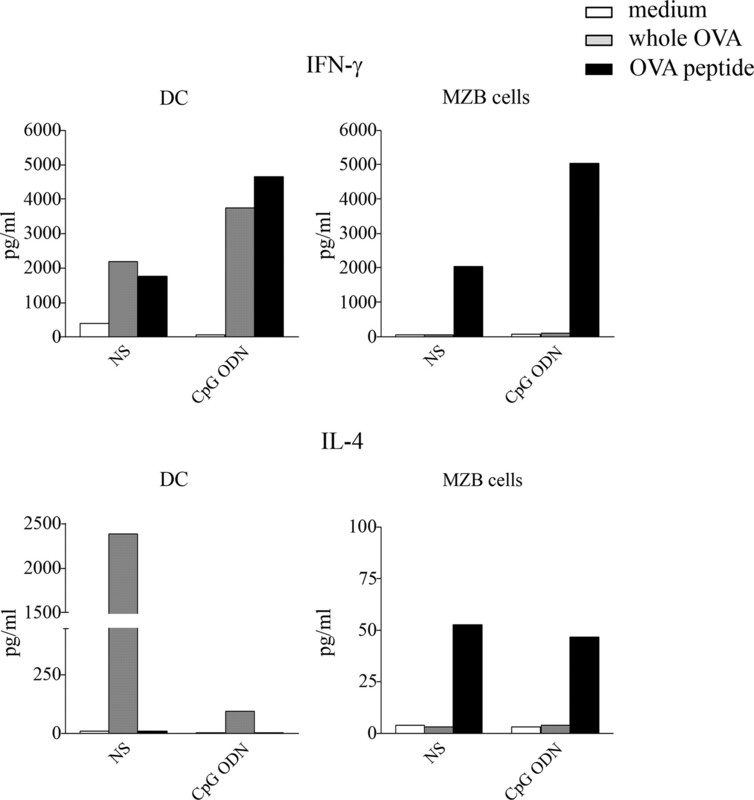 (40), IL-4 production was only detected in response to OVA-loaded DC (Fig. 3⇓). Addition of CpG ODN further increased IFN-γ production in response to both OVA protein and peptide whereas IL-4 production was decreased with OVA-sensitized DC. In contrast to DC, OVA-sensitized MZB cells did not elicit cytokine production by CD4+ T lymphocytes. Interestingly, OVA peptide-loaded MZB cells induced IFN-γ as well as IL-4 production by CD4+ T lymphocytes and addition of CpG ODN during the sensitization phase amplified IFN-γ release. Thus, MZB cells pulsed with OVA peptide, but not whole OVA, activate Ag-specific CD4+ T lymphocytes to secrete cytokines and CpG ODN stimulation favors a more pronounced Th1 response. Unstimulated or CpG ODN-stimulated MZB cells present OVA peptide to CD4+ T lymphocytes to promote their activation. Highly purified MZB cells or DC were exposed to the whole OVA protein (50 μg/ml) or OVA peptide (1 μg/ml), in the presence or not of CpG ODN (5 μg/ml), for 18 h. After extensive washing, MZB and DC were cocultured with purified OVA-specific CD4+ T lymphocytes for 5 days. IFN-γ and IL-4 production was quantified by ELISA 2 days after anti-CD3 restimulation. One experiment representative of three independent experiments is shown. As previously described, MZB cells express copious amount of CD1d, this expression being higher than in DC ((41) and data not shown). For this reason, we investigated whether MZB cells could activate iNKT cells in response to free α-GalCer as well as in response to CpG ODN, an indirect activator of iNKT cells (14, 42). To avoid cell activation, iNKT cells were sorted on the basis of CD5 and NK1.1 staining. 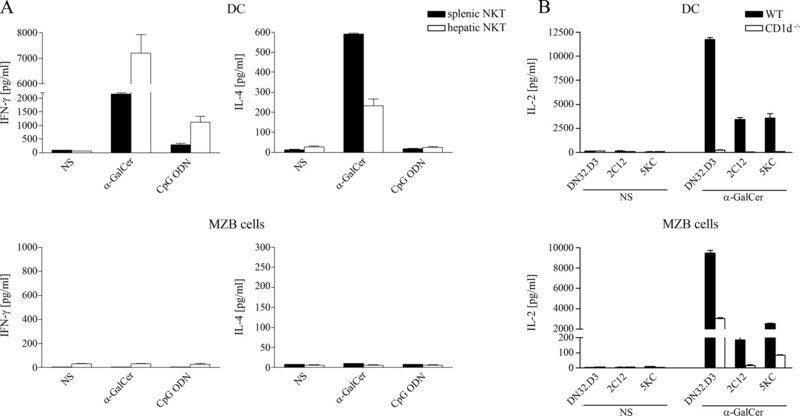 Purified MZB cells and DC were exposed to α-GalCer or to CpG ODN, extensively washed, and cocultured with sorted splenic CD5+ NK1.1+ (NKT) cells. As expected, α-GalCer-loaded DC promoted IFN-γ and IL-4 production by splenic NKT cells (Fig. 4⇓A). In stark contrast, NKT cells failed to release IFN-γ and IL-4 in response to α-GalCer-sensitized MZB cells. In response to CpG ODN, DC elicited a moderate IFN-γ production by splenic NKT cells whereas MZB cells were unable to activate them. Since splenic CD5+ NK1.1+ cells contain ∼50% of non-iNKT cells ((43) and data not shown) that could interfere with iNKT cell activation, hepatic CD5+ NK1.1+ cells (∼90% iNKT cells) (Ref. 44); and data not shown) were used in our coculture system. As expected, α-GalCer or CpG ODN-treated DC promoted IFN-γ secretion by iNKT cells as well as IL-4 in response to α-GalCer-sensitized DC (Fig. 4⇓A). However, at the doses used, α-GalCer-pulsed or CpG ODN-treated MZB cells did not elicit IFN-γ or IL-4 by hepatic CD5+ NK1.1+ cells (Fig. 4⇓A). α-GalCer loaded MZB cells activate iNKT cell hybridomas but not ex vivo sorted CD5+ NK1.1+ cells. A, MZB cells or DC were loaded with α-GalCer or stimulated with CpG ODN for 3 or 18 h, respectively, extensively washed, and then cocultured with splenic or hepatic CD5+ NK1.1+ cells. After 48 h, IFN-γ and IL-4 production was quantified by ELISA. B, WT or CD1d−/− MZB cells or DC were loaded with α-GalCer for 3 h, washed, and cocultured with the iNKT cell hybridomas DN32.D3, 2C12 and 5KC. Results represent the mean ± SD of three independent experiments (A). One experiment out of three is shown (B). The results represent the mean ± SD of duplicates. Next, we tested the capacity of MZB cells to activate iNKT cell hybridomas, a process that is independent upon innate cytokines or co-stimulation. As expected, α-GalCer-sensitized DC promoted IL-2 secretion by the DN32.D3, 2C12, and 5KC hybridomas (Fig. 4⇑B). Interestingly, α-GalCer-sensitized MZB cells also induced IL-2 release by all iNKT cell hybridomas. This activation was CD1d-dependent since no IL-2 production was detected when CD1d−/− DC or CD1d−/− MZB cells were used. Of note, albeit strongly reduced (∼70%), the DN32.D3 hybridoma produced a residual amount of IL-2 when cocultured with α-GalCer-loaded CD1d−/− MZB cells. This phenomenon might be due to α-GalCer autopresentation by the DN32.D3 hybridoma itself (45). Finally, although CpG ODN-sensitized DC induced IL-2 production by iNKT cell hybridomas, CpG ODN-sensitized MZB cells failed to do so (data not shown). In conclusion, despite high level of CD1d expression, α-GalCer or CpG ODN-sensitized MZB cells are unable to directly stimulate ex vivo-sorted splenic or hepatic iNKT cells. However, their ability to activate, in a CD1d-dependent manner, iNKT cell hybridomas suggests that, when exposed to free α-GalCer, MZB cells can present α-GalCer to iNKT cells. The inability of α-GalCer-sensitized MZB cells to directly stimulate ex vivo sorted iNKT cells suggests that additional soluble and/or membrane bound co-factors are necessary. Since DC are well equipped to induce iNKT cell activation, we hypothesized that they might help MZB cells to promote cytokine release by iNKT cells. As shown in Fig. 5⇓, addition of untreated DC triggered IFN-γ and IL-4 secretion by iNKT cells when cocultured with α-GalCer-pulsed MZB cells. To investigate the role of DC-expressed CD1d in this phenomenon, CD1d−/− DC were used. As shown in Fig. 5⇓, iNKT cell production of IFN-γ and IL-4 was strongly, but not completely, reduced in the presence of CD1d−/− DC (∼70% and ∼55%, respectively). As a whole, these data suggest that DC help MZB cells to promote iNKT cell activation in part through α-GalCer cross-presentation or through self ligand (CD1d dependency) and in part through DC-expressed co-factors. Addition of DC restores IFN-γ and IL-4 production by iNKT cells cocultured with α-GalCer-loaded MZB cells. MZB cells were loaded with α-GalCer and then cocultured with CD5+ NK1.1+ cells for 48 h in the presence or absence of unloaded WT or CD1d−/− DC. Cytokine production was assessed by ELISA. One experiment out of three is shown. Results represent the mean ± SD of duplicates. *, p < 0.05; **, p < 0.01; ***, p < 0.001. To investigate whether MZB cells could also help DC to trigger iNKT cell activation, MZB cells were added to co-cultures containing α-GalCer-loaded DC and hepatic CD5+ NK1.1+ cells. Interestingly, addition of naive MZB cells moderately (∼25%) increased IFN-γ, but not IL-4, release by iNKT cells (Fig. 6⇓A). 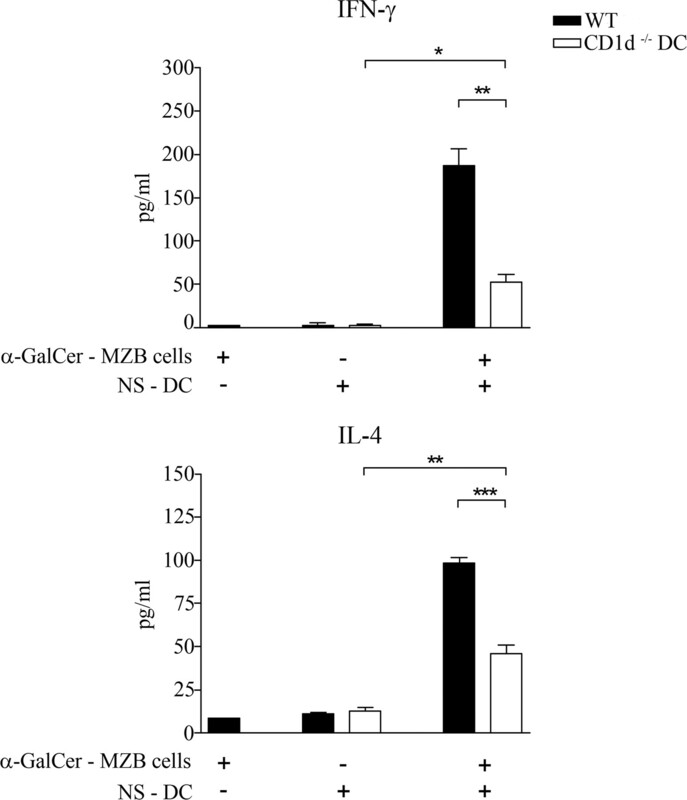 Moreover, α-GalCer-loaded MZB cells amplified IFN-γ and IL-4 responses (∼50% and 40%, respectively). To further demonstrate the cooperative role of MZB cells in iNKT cell activation, splenocytes were electronically depleted in MZB cells (Fig. 6⇓B, upper panel) and exposed to grading doses of α-GalCer. Of note, MZB cell depletion did not modify the proportion of DC, iNKT cells and NK cells (data not shown). As represented in Fig. 6⇓B (lower panel), and relative to the control, depletion of MZB cells decreased IFN-γ and IL-4 production by splenocytes. Thus, MZB cells optimize the activation of iNKT cells in response to α-GalCer. MZB cells participate to optimal iNKT cell activation. A, α-GalCer-loaded DC were cocultured with hepatic CD5+ NK1.1+ cells for 48 h in the presence or absence of unstimulated or α-GalCer-sensitized MZB cells. IFN-γ and IL-4 production were quantified by ELISA. B, Splenocytes were stained with CD19, CD21, and CD23 mAb and then MZB cells were depleted using the FACSAria. The upper panel shows dot plots representing the proportion of MZB cells, among CD19+ cells, before and after cell depletion. 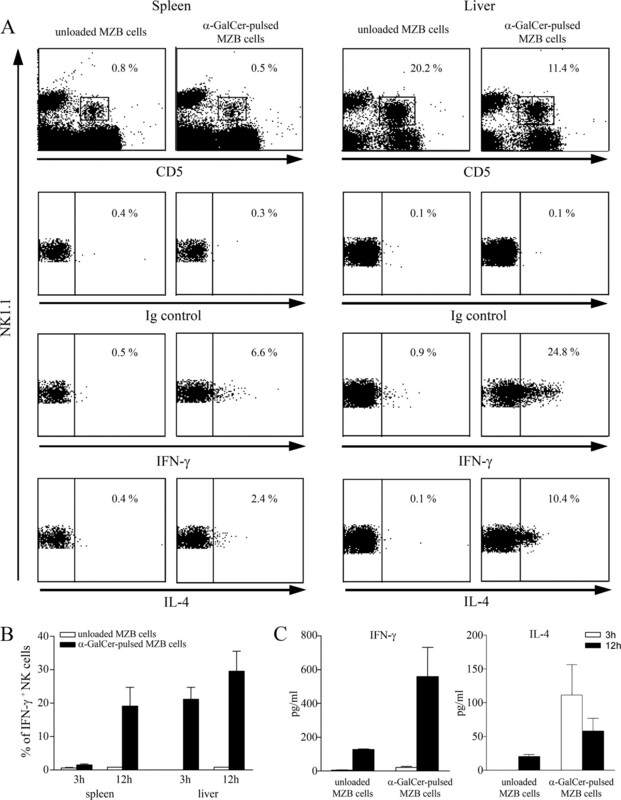 Control or MZB-depleted splenocytes were cultured for 48 h with grading doses of α-GalCer and cytokine production in the supernatant was evaluated by ELISA (lower panel). Data represent the mean ± SD of three independent experiments (A). *, p < 0.05; **. p < 0.01; ***, p < 0.001. Shown is a representative experiment out of three and results represent the mean of duplicate ± SD (B). We next investigated whether α-GalCer-loaded MZB cells could activate iNKT cells in vivo. Unloaded or α-GalCer-loaded MZB cells were injected i.v. into recipient mice and the activation state of splenic and liver NKT cells was determined 3 h later by intracellular FACS staining. Injection of α-GalCer-sensitized MZB cells induced a decreased frequency of CD5+ NK1.1+ cells in the spleen (0.8% vs 0.5%) and the liver (20.2% vs 11.4%) (Fig. 7⇓A), an effect likely due to NK1.1 down-modulation (46). Interestingly, compared with unloaded MZB cells, α-GalCer-loaded MZB cells promoted an increased frequency of NKT cells positive for IFN-γ and IL-4 in the spleen and the liver. This increased frequency was still observed 12 h postinjection (data not shown). Moreover, 12 h postinjection, splenic and hepatic CD5− NK1.1+ (NK cells) also labeled positively for IFN-γ whereas 3 h post injection, only hepatic NK cells produced IFN-γ intracellularly (Fig. 7⇓B). Finally, analysis of cytokine concentration in the serum of mice injected with α-GalCer-loaded MZB cells revealed the presence of IL-4 and IFN-γ (Fig. 7⇓C). Altogether, our data show that MZB cells efficiently activate the iNKT/NK cell pathway in vivo. α-GalCer-sensitized MZB cells activate iNKT cells in vivo. WT mice were i.v. injected with α-GalCer-sensitized MZB cells and sacrified 3 h (A–C) or 12 h (B and C) later. A, Spleen and liver MNC were stained with CD5 and NK1.1 mAbs and analyzed by flow cytometry. Gated CD5+ NK1.1+ cells were screened for intracellular IFN-γ and IL-4 production and the percentage of positive cells are represented. B, Gated splenic and hepatic CD5−NK1.1+ cells were screened for intracellular IFN-γ production. C, Production of IFN-γ and IL-4 was evaluated in the sera of mice injected, 3 and 12 h earlier, with unloaded or α-GalCer-loaded MZB cells. One experiment representative of two is shown. B and C, Results represent the mean ± SD of 3 animals. MZB cells are ideally poised in the spleen to sense blood-borne microorganisms and to participate in innate/acquired immune responses. We show that, in response to all tested TLR agonists (except poly(I:C)), MZB cells proliferate and exhibit a similar phenotypic maturation process characterized by an increased expression of MHC class II, CD40, and CD86 molecules. On the other hand, MZB cells display a different cytokine profile according to the TLR agonist used, with R848 (TLR7) and CpG ODN (TLR9) as main IL-6 and IL-10 inducers. These results are in line with three recent studies reporting that MZB cells can sense TLR agonists to mature, with the exception of TLR3, a molecular sensor for double-stranded (viral) RNA (7, 8, 9). In addition, we show for the first time that MZB cells produce IFN-β, a key anti-viral cytokine, in response to CpG ODN (but not to other agonists). Together, our results suggest that, like DC, MZB cells can become activated in response to a large panel of TLR agonists, a property that might be important to promote innate and adaptive immune responses during infection. Some reports have suggested that MZB cells contribute to the development of T cell responses (6, 47). Our in vitro data show that MZB cells can present peptide Ag to trigger T cell activation, a property possibly linked to the high level of MHC class II, CD40, and CD86 expression (4). Although less flexible than DC, activation of TLR9 in MZB cells polarizes the T cell response toward a more Th1 direction. This finding cannot be explained by IL-12 induction following CpG ODN stimulation and rather suggests the involvement of other Th1-promoting soluble or membrane-bound (i.e., CD40) factor(s). On the other hand, MZB cells sensitized with the whole OVA protein do not activate CD4+ T lymphocytes, a phenomenon likely due to the low frequency of Ag (OVA) specific MZB cells in the system. Attanavanitch et al. elegantly reported that MZB cells from transgenic mice expressing BCR specific for hen egg lysozyme (but not from WT animals) efficiently activate ex vivo Ag-specific CD4+ T cells (6). Altogether, these results infer that MZB cells can present peptide Ag to specific T lymphocytes but, unlike DC, fail to do so unless Ag internalization is facilitated by BCR. Having established that peptide-pulsed MZB cells can stimulate conventional T cells, we next studied their capacity to activate iNKT cells in response to free α-GalCer. Recently, using total B lymphocytes (32, 33, 34), and to a lower extent MZB cells (32, 34), it has been elegantly demonstrated that specific internalization of α-GalCer via the BCR efficiently activates iNKT cells that in turn provide cognate help for Ab production. While this mode of BCR-mediated Ag internalization might be of importance in the case of particulate antigenic lipids, the effect of soluble (non-particulate) antigenic lipids on MZB cell-mediated activation of iNKT cell remains uncharted. Despite a high level of CD1d, CD40, and CD86 expression on their surface, MZB cells pulsed with free α-GalCer fail to directly activate ex vivo sorted splenic and hepatic CD5+ NK1.1+ cells, at least in term of cytokine (IL-4 and IFN-γ) release. Of note, IL-17 and IL-21, two other cytokines recently described to be produced by iNKT cells (48, 49) were also absent in the coculture supernatants (data not shown). To fully eliminate a potential interfering role of non-iNKT cells in our setting, we also utilized CD1d/α-GalCer tetramer+ TCRβ+ cells in the coculture system, although this procedure is known to partially activate iNKT cells (14, 50). In this condition, α-GalCer-sensitized MZB cells also failed to directly activate primary (ex vivo sorted) iNKT cells (data not shown). On the other hand, and in agreement with (32) who used total B lymphocytes, our data show that α-GalCer-loaded MZB cells activate, in a CD1d-dependent manner, iNKT cell hybridomas. It is known that TCR-dependent activation of iNKT cell hybridomas can occur without any other co-stimulation. This suggests that, probably by direct surface loading of CD1d, soluble α-GalCer can be presented by MZB cells to trigger TCR-mediated signals in iNKT cells. However, MZB cells lack co-stimulatory factors (i.e., innate cytokines such as IL-12) necessary to achieve activation of primary iNKT cells in vitro (see below). The ability of TLR9-stimulated MZB cells to activate iNKT cells was also assessed. We show that, unlike TLR9-activated DC (14), MZB cells stimulated with CpG ODN do not activate either primary iNKT cells or iNKT cell hybridomas, a phenomenon probably due to the absence of CD1d-restricted endogenous glycolipid biosynthesis in MZB cells. We next questioned whether DC could help MZB cells to activate primary iNKT cells. We show that addition of untreated DC restores IFN-γ and IL-4 production by iNKT cells cocultured with α-GalCer-loaded MZB cells. Surprisingly, this process is strongly dependent on CD1d expression on DC suggesting that the latter might cross present α-GalCer to iNKT cells, as previously reported (51). Indeed, these authors demonstrated that splenic CD8α+ DC can pick up α-GalCer from dying tumor cells in vivo to cross present it to iNKT cells. Another possibility is that DC help MZB cells by presenting (a) CD1d-restricted self-Ag(s), as recently suggested by Cheng et al. (52). Finally, although reduced, CD1d−/− DC still help MZB cells to activate iNKT cells suggesting that co-stimulatory factors are also necessary. The nature of the candidate(s) is still under investigation. Using specific mAb, we have excluded IL-12 as a potential candidate (not shown) and attempts are now underway to identify its (their) nature. We next questioned whether MZB cells could help α-GalCer-loaded DC to modulate iNKT cell activation. Addition of naive MZB cells in our culture system significantly increased IFN-γ, but not IL-4, release by iNKT cells, a phenomenon probably due to high CD40 expression on MZB cells, the latter being known to enhance IFN-γ production by iNKT cells (53). This additive effect, as well as enhanced IL-4 release, was also observed after addition of α-GalCer-loaded MZB, thus suggesting a cooperative role of MZB cells in iNKT cell activation. Importantly, this assumption is supported by the fact that MZB-depleted spleen cells produce less cytokines when exposed to α-GalCer, relative to total splenocytes (Fig. 6⇑B). Thus, DC and MZB cells appear to cooperate, at least in vitro, to achieve optimal iNKT cell activation in response to α-GalCer. This observation might be relevant in vivo and is consistent with the anatomical co-localization of DC, MZB cells and iNKT cells in the marginal zone of the spleen (36). Finally, we report for the first time that α-GalCer-loaded MZB cells can activate iNKT cells in vivo to produce IFN-γ and IL-4, a process that leads to the bystander activation of NK cells. It is likely that, in this setting, accessory cells including DC intervene in this activation pathway. Our results support a role for MZB cells in iNKT cell activation in vivo and are in line with previous studies reporting that α-GalCer-loaded B lymphocytes efficiently activate iNKT cells in vivo (54, 55, 56). These data do not run counter those from Bezbradica et al. (57). Indeed, using B cell-deficient mice, these authors reported that B lymphocytes suppressed DC-mediated iNKT and NK cell activation after in vivo injection of free α-GalCer. The experimental approaches used in both studies are different and the use of MZB cell-deficient mice would be useful to more fully assess the in vivo functions of MZB cells. Some studies reported that injection of mAbs specific for LFA-1 and VLA-4 specifically depletes the spleen from MZB cells ((17, 58) and data not shown). Although very promising, this approach is not exploitable since blockade of LFA-1 also abrogates DC-mediated iNKT cell activation (Ref. 59 , 60 and data not shown). In conclusion, our study provides evidence that MZB cells react (i.e., cytokine release) to a large panel of TLR agonists and that CpG ODN-stimulated peptide-pulsed MZB cells polarize CD4+ T lymphocytes toward a more Th1 direction. When sensitized with soluble α-GalCer, MZB cells stimulate the release of both IFN-γ and IL-4 by iNKT cells, but only in the presence of accessory cells (DC). The later finding strongly suggests that MZB cells have the potential, under certain circumstances (i.e., exogenous activation by α-GalCer), to condition iNKT cell functions in vivo. This, and the fact that BCR facilitates the uptake of particulate lipid Ag and its transport to CD1d-containing endocytic compartments reinforce the hypothesis that MZB cell/iNKT cell interplays may be of particular importance, for instance for Ab production. Whether MZB cells influence the immune response during infection or after exogenous activation by α-GalCer is still unknown and awaits further studies. We greatly acknowledge Dr. L. Van Kaer (Vanderbilt University, Nashville, TN) for the gift of CD1d−/− C57BL/6 mice. We thank Dr A. Bendelac (University of Chicago, IL) for the gift of the NKT cell hybridoma DN32.D3 and 2C12 and Dr L. Gapin (University of Colorado Health Science Center, Denver, CO) for the gift of NKT cell hybridoma 5KC. Drs. L. Gapin and T. Mallevaey (Denver, CO) are acknowledged for the helpful discussion and C. Vendeville (Inserm U547, Lille, France) for technical assistance. ↵3 Abbreviations used in this paper: MZB, marginal zone B; DC, dendritic cell; CpG ODN, CpG oligodeoxynucleotide; α-GalCer, α-galactosylceramide; iNKT, invariant NKT; MNC, mononuclear cell; WT, wild type. Pillai, S., A. Cariappa, S. T. Moran. 2005. Marginal zone B cells. Annu. Rev. Immunol. 23: 161-196. Zandvoort, A., W. Timens. 2002. The dual function of the splenic marginal zone: essential for initiation of anti-TI-2 responses but also vital in the general first-line defense against blood-borne antigens. Clin. Exp. Immunol. 130: 4-11. Oliver, A. M., F. Martin, J. F. Kearney. 1999. IgMhighCD21high lymphocytes enriched in the splenic marginal zone generate effector cells more rapidly than the bulk of follicular B cells. J. Immunol. 162: 7198-7207. Cinamon, G., M. A. Zachariah, O. M. Lam, F. W. Foss, Jr, J. G. Cyster. 2008. Follicular shuttling of marginal zone B cells facilitates antigen transport. Nat. Immunol. 9: 54-62. Attanavanich, K., J. F. Kearney. 2004. Marginal zone, but not follicular B cells, are potent activators of naive CD4 T cells. J. Immunol. 172: 803-811. Barr, T. A., S. Brown, G. Ryan, J. Zhao, D. Gray. 2007. TLR-mediated stimulation of APC: distinct cytokine responses of B cells and dendritic cells. Eur. J. Immunol. 37: 3040-3053. Rubtsov, A. V., C. L. Swanson, S. Troy, P. Strauch, R. Pelanda, R. M. Torres. 2008. TLR agonists promote marginal zone B cell activation and facilitate T-dependent IgM responses. J. Immunol. 180: 3882-3888. Van Kaer, L., S. Joyce. 2005. Innate immunity: NKT cells in the spotlight. Curr. Biol. 15: R429-R431. Paget, C., T. Mallevaey, A. O. Speak, D. Torres, J. Fontaine, K. C. Sheehan, M. Capron, B. Ryffel, C. Faveeuw, M. Leite de Moraes, F. Platt, F. Trottein. 2007. Activation of invariant NKT cells by toll-like receptor 9-stimulated dendritic cells requires type I interferon and charged glycosphingolipids. Immunity 27: 597-609. Salio, M., A. O. Speak, D. Shepherd, P. Polzella, P. A. Illarionov, N. Veerapen, G. S. Besra, F. M. Platt, V. Cerundolo. 2007. Modulation of human natural killer T cell ligands on TLR-mediated antigen-presenting cell activation. Proc. Natl. Acad. Sci. USA 104: 20490-20495. Tupin, E., Y. Kinjo, M. Kronenberg. 2007. The unique role of natural killer T cells in the response to microorganisms. Nat. Rev. Microbiol. 5: 405-417. Belperron, A. A., C. M. Dailey, L. K. Bockenstedt. 2005. Infection-induced marginal zone B cell production of Borrelia hermsii-specific antibody is impaired in the absence of CD1d. J. Immunol. 174: 5681-5686. Hansen, D. S., M. A. Siomos, T. De Koning-Ward, L. Buckingham, B. S. Crabb, L. Schofield. 2003. CD1d-restricted NKT cells contribute to malarial splenomegaly and enhance parasite-specific antibody responses. Eur. J. Immunol. 33: 2588-2598. Kobrynski, L. J., A. O. Sousa, A. J. Nahmias, F. K. Lee. 2005. Cutting edge: antibody production to pneumococcal polysaccharides requires CD1 molecules and CD8+ T cells. J. Immunol. 174: 1787-1790. Lang, M. L., A. Glatman-Freedman. 2006. Do CD1-restricted T cells contribute to antibody-mediated immunity against Mycobacterium tuberculosis?. Infect. Immun. 74: 803-809. Takahashi, T., S. Strober. 2008. Natural killer T cells and innate immune B cells from lupus-prone NZB/W mice interact to generate IgM and IgG autoantibodies. Eur. J. Immunol. 38: 156-165. Galli, G., S. Nuti, S. Tavarini, L. Galli-Stampino, C. De Lalla, G. Casorati, P. Dellabona, S. Abrignani. 2003. CD1d-restricted help to B cells by human invariant natural killer T lymphocytes. J. Exp. Med. 197: 1051-1057. Lang, G. A., T. S. Devera, M. L. Lang. 2008. Requirement for CD1d expression by B cells to stimulate NKT cell-enhanced antibody production. Blood 111: 2158-2162. Lang, G. A., M. A. Exley, M. L. Lang. 2006. The CD1d-binding glycolipid α-galactosylceramide enhances humoral immunity to T-dependent and T-independent antigen in a CD1d-dependent manner. Immunology 119: 116-125. Rossignol, A., A. Barra, A. Herbelin, J. L. Preud'homme, J. M. Gombert. 2007. Freshly isolated Vα24+ CD4+ invariant natural killer T cells activated by α-galactosylceramide-pulsed B cells promote both IgG and IgE production. Clin. Exp. Immunol. 148: 555-563. Tonti, E., G. Galli, C. Malzone, S. Abrignani, G. Casorati, P. Dellabona. 2009. NKT-cell help to B lymphocytes can occur independently of cognate interaction. Blood 113: 370-376. Devera, T. S., H. B. Shah, G. A. Lang, M. L. Lang. 2008. Glycolipid-activated NKT cells support the induction of persistent plasma cell responses and antibody titers. Eur. J. Immunol. 38: 1001-1011. Galli, G., P. Pittoni, E. Tonti, C. Malzone, Y. Uematsu, M. Tortoli, D. Maione, G. Volpini, O. Finco, S. Nuti, et al 2007. Invariant NKT cells sustain specific B cell responses and memory. Proc. Natl. Acad. Sci. USA 104: 3984-3989. Barral, P., J. Eckl-Dorna, N. E. Harwood, C. De Santo, M. Salio, P. Illarionov, G. S. Besra, V. Cerundolo, F. D. Batista. 2008. B cell receptor-mediated uptake of CD1d-restricted antigen augments antibody responses by recruiting invariant NKT cell help in vivo. Proc. Natl. Acad. Sci. USA 105: 8345-8350. Lang, G. A., P. A. Illarionov, A. Glatman-Freedman, G. S. Besra, M. L. Lang. 2005. BCR targeting of biotin-α-galactosylceramide leads to enhanced presentation on CD1d and requires transport of BCR to CD1d-containing endocytic compartments. Int. Immunol. 17: 899-908. Leadbetter, E. A., M. Brigl, P. Illarionov, N. Cohen, M. C. Luteran, S. Pillai, G. S. Besra, M. B. Brenner. 2008. NK T cells provide lipid antigen-specific cognate help for B cells. Proc. Natl. Acad. Sci. USA 105: 8339-8344. Roark, J. H., S. H. Park, J. Jayawardena, U. Kavita, M. Shannon, A. Bendelac. 1998. CD1.1 expression by mouse antigen-presenting cells and marginal zone B cells. J. Immunol. 160: 3121-3127. Mendiratta, S. K., W. D. Martin, S. Hong, A. Boesteanu, S. Joyce, L. Van Kaer. 1997. CD1d1 mutant mice are deficient in natural T cells that promptly produce IL-4. Immunity 6: 469-477. Mallevaey, T., J. P. Zanetta, C. Faveeuw, J. Fontaine, E. Maes, F. Platt, M. Capron, M. L. de-Moraes, F. Trottein. 2006. Activation of invariant NKT cells by the helminth parasite schistosoma mansoni. J. Immunol. 176: 2476-2485. Takeda, K., S. Akira. 2005. Toll-like receptors in innate immunity. Int. Immunol. 17: 1-14. Constant, S., C. Pfeiffer, A. Woodard, T. Pasqualini, K. Bottomly. 1995. Extent of T cell receptor ligation can determine the functional differentiation of naive CD4+ T cells. J. Exp. Med. 182: 1591-1596. Dougan, S. K., A. Kaser, R. S. Blumberg. 2007. CD1 expression on antigen-presenting cells. Curr. Top. Microbiol. Immunol. 314: 113-141. Tyznik, A. J., E. Tupin, N. A. Nagarajan, M. J. Her, C. A. Benedict, M. Kronenberg. 2008. Cutting edge: the mechanism of invariant NKT cell responses to viral danger signals. J. Immunol. 181: 4452-4456. Mallevaey, T., J. Fontaine, L. Breuilh, C. Paget, A. Castro-Keller, C. Vendeville, M. Capron, M. Leite-de-Moraes, F. Trottein, C. Faveeuw. 2007. Invariant and noninvariant natural killer T cells exert opposite regulatory functions on the immune response during murine schistosomiasis. Infect. Immun. 75: 2171-2180. Hammond, K. J., D. G. Pellicci, L. D. Poulton, O. V. Naidenko, A. A. Scalzo, A. G. Baxter, D. I. Godfrey. 2001. CD1d-restricted NKT cells: an interstrain comparison. J. Immunol. 167: 1164-1173. Hameg, A., I. Apostolou, M. Leite-De-Moraes, J. M. Gombert, C. Garcia, Y. Koezuka, J. F. Bach, A. Herbelin. 2000. A subset of NKT cells that lacks the NK1.1 marker, expresses CD1d molecules, and autopresents the α-galactosylceramide antigen. J. Immunol. 165: 4917-4926. Lopes-Carvalho, T., J. Foote, J. F. Kearney. 2005. Marginal zone B cells in lymphocyte activation and regulation. Curr. Opin. Immunol. 17: 244-250. Coquet, J. M., K. Kyparissoudis, D. G. Pellicci, G. Besra, S. P. Berzins, M. J. Smyth, D. I. Godfrey. 2007. IL-21 is produced by NKT cells and modulates NKT cell activation and cytokine production. J. Immunol. 178: 2827-2834. Michel, M. L., A. C. Keller, C. Paget, M. Fujio, F. Trottein, P. B. Savage, C. H. Wong, E. Schneider, M. Dy, M. C. Leite-de-Moraes. 2007. Identification of an IL-17-producing NK1.1(neg) iNKT cell population involved in airway neutrophilia. J. Exp. Med. 204: 995-1001. Sidobre, S., M. Kronenberg. 2002. CD1 tetramers: a powerful tool for the analysis of glycolipid-reactive T cells. J. Immunol. Methods 268: 107-121. Shimizu, K., Y. Kurosawa, M. Taniguchi, R. M. Steinman, S. Fujii. 2007. Cross-presentation of glycolipid from tumor cells loaded with α-galactosylceramide leads to potent and long-lived T cell mediated immunity via dendritic cells. J. Exp. Med. 204: 2641-2653. Cheng, L., A. Ueno, S. Cho, J. S. Im, S. Golby, S. Hou, S. A. Porcelli, Y. Yang. 2007. Efficient activation of Vα14 invariant NKT cells by foreign lipid antigen is associated with concurrent dendritic cell-specific self recognition. J. Immunol. 178: 2755-2762. Chang, J. H., J. M. Lee, H. J. Youn, K. A. Lee, Y. Chung, A. Y. Lee, M. N. Kweon, H. Y. Kim, M. Taniguchi, C. Y. Kang. 2008. Functional maturation of lamina propria dendritic cells by activation of NKT cells mediates the abrogation of oral tolerance. Eur. J. Immunol. 38: 2727-2739. Chung, Y., B. S. Kim, Y. J. Kim, H. J. Ko, S. Y. Ko, D. H. Kim, C. Y. Kang. 2006. CD1d-restricted T cells license B cells to generate long-lasting cytotoxic antitumor immunity in vivo. Cancer Res. 66: 6843-6850. Kim, Y. J., H. J. Ko, Y. S. Kim, D. H. Kim, S. Kang, J. M. Kim, Y. Chung, C. Y. Kang. 2008. α-Galactosylceramide-loaded, antigen-expressing B cells prime a wide spectrum of antitumor immunity. Int. J. Cancer 122: 2774-2783. Bezbradica, J. S., A. K. Stanic, N. Matsuki, H. Bour-Jordan, J. A. Bluestone, J. W. Thomas, D. Unutmaz, L. Van Kaer, S. Joyce. 2005. Distinct roles of dendritic cells and B cells in Va14Ja18 natural T cell activation in vivo. J. Immunol. 174: 4696-4705. Lu, T. T., J. G. Cyster. 2002. Integrin-mediated long-term B cell retention in the splenic marginal zone. Science 297: 409-412. Matsumoto, G., E. Kubota, Y. Omi, U. Lee, J. M. Penninger. 2004. Essential role of LFA-1 in activating Th2-like responses by α-galactosylceramide-activated NKT cells. J. Immunol. 173: 4976-4984. Ohteki, T., C. Maki, S. Koyasu, T. W. Mak, P. S. Ohashi. 1999. Cutting edge: LFA-1 is required for liver NK1.1+TCRαβ+ cell development: evidence that liver NK1.1+TCRαβ+ cells originate from multiple pathways. J. Immunol. 162: 3753-3756.